The Department of Recreational Sports will give students a break from studying for their final examinations with food, prizes and massages on Monday and Tuesday (Dec. 10-11). Finals Relief will be held from 5-8 p.m. on Dec. 10 and from 11 a.m. to 2 p.m. on Dec. 11 in the Health and Kinesiology Center. "This time of year, students are looking for stress relievers, and we want to offer them a positive way to relieve stress," said Tina De Ases, Rec Sports senior assistant director for marketing and special events. Students who need a break can color pictures, get a massage, make a stress ball, or race up the climbing wall. This year’s event is being held twice to accommodate commuter students who don’t have the opportunity to participate in the night event, De Ases said. “We decided to do it earlier in the day to see if we can offer help to more students on campus,” she said. The event will be held in conjunction with the Alcohol and Drug Abuse Initiative and the Counseling Center. For more information, contact De Ases at 936.294.3658 or tdeases@shsu.edu. 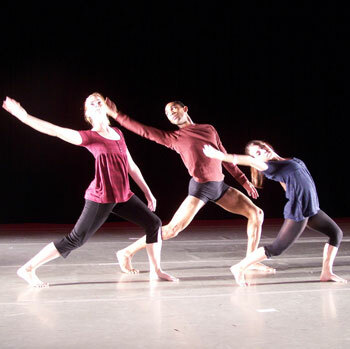 Students practice for the Senior Studio Performance Concert, which will be held On Dec. 11-12 in the ABIII Dance Theater. Fourteen senior choreographers will present their own dances during the fall studio performance concert on Tuesday and Wednesday (Dec. 11-12). 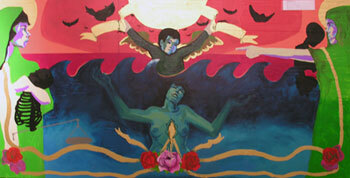 The concert, Rapid Eye Movement, will be held at 8 p.m. on both days in the Academic Building III Dance Theater. Each choreographed piece deals with dreamscapes, personal interpretations and individual statements about the world, according to Hilary Bryan, visiting assistant professor of dance. The “extremely diverse” works will delve into such topics as Parkinson’s disease, Japan, spirituality, the hijab worn by women in the Middle Eastern countries and women and body issues, as well as some light-hearted pieces. “There are several pieces that specifically deal with dreaming, but the idea is of these diverse snapshots of life and personal interpretations of what’s going on in the world,” Bryan said. The concert, which is the culminating event for the choreography series, will also include a “huge cast” of approximately 40 dancers. “This is what they’ve been gearing up for their whole career here at Sam, so it’s a really, really big event for them,” Bryan said. Admission is free; however, seating is limited, so attendees are encouraged to arrive early. For more information, call the dance program at 936.294.1875. This piece by Ashley Ward will be one of many on display in the Gaddis Geeslin Gallery through Dec. 15 as part of the art department's Graduating Senior Exhibit. Graduating art majors will reveal their paintings, drawings, collages and photography beginning Monday (Dec. 10) in the Gaddis Geeslin Gallery. The Graduating Senior Exhibit will be held through Dec. 15, when a reception will be held following the commencement ceremony. The reception, expected to begin around noon, is open to the public, and refreshments will be served, according to art department audio/visual librarian Debbie Davenport. The exhibit will feature Bachelor of Fine Arts candidates, including Martha Leatherman, Stacey Thomas, Ashley Ward, Arnea Williams and Josh Wilson. The Gaddis Geeslin Gallery, located in Art Building F, is open Monday through Friday from noon to 5 p.m.
For more information, call the art department at 936.294.1317 or visit http://www.shsu.edu/~gallery/. Raymond Teske, Jr., professor of criminal justice, will be on developmental leave from Sam Houston State University during the 2008 spring semester to do research in Germany. Teske will continue his research on the prosecution of hate crime offenders there, comparing the prosecution outcome and sentencing with a control sample of non-hate crime related offenses. He will also continue work on hate crime statistics created for him and a German colleague by the state police in Baden-Württemberg. Comparable data and cases are being analyzed in Texas. A third project on which he has been working for more than five years involves a study of changes in crime rates before and after unification in Germany. Each of the projects represents a joint venture with professor Hans-Jörg Albrecht, director of the Max Planck Institute. Albrecht is a former Beto Chair lecturer and has visited the Criminal Justice Center to make presentations on several occasions. Teske's three-month stay in Germany is being funded by an honorary award from the Alexander von Humboldt Foundation, which will pay for his living expenses, airfare, supplemental allowances for research, and conference-related travel within Germany, as well as expenses for his wife, Jane, to accompany him during his stay. Teske was first awarded an Alexander von Humboldt Fellowship for young scholars in 1980 and spent 12 months at the Max Planck Institute establishing and carrying out the first large-scale (sample of 3,600) crime victimization survey in Germany. "I am extremely grateful for this award, at this level of support, and for all of their previous support, from the Humboldt Foundation, the Max Planck Institute, and Sam Houston State University," Teske said. The early childhood education book “Inclusive Lesson Plans Throughout the Year,” written by four SHSU faculty members, has been awarded as “Judges’ Selection” and an “Outstanding Product for 2007” by Early Childhood News. The book won the ECN “Directors’ Choice Award” earlier this year and was selected from all of the “Directors’ Choice” category winners for the “Judges’ Selection Award,” according to a press release from Gryphon House, Inc., the book’s publisher. “Inclusive Lesson Plans Throughout the Year” was written by Laverne Warner, professor emerita of early childhood education; Sharon Lynch, professor of special education; and Diana Nabors and Cynthia Simpson, both of whom are assistant professors in the language, literacy and special populations department. Organized by season, the book has over 150 lesson plans for early childhood teachers who work with children with special needs. Each plan has a learning objective, materials list, directions for preparation, an assessment component, extension activities to connect the lesson plan to different areas of the curriculum, and adaptations for children with a variety of special needs. In addition, each lesson plan has modifications for children with autism spectrum disorder; speech/language, visual, hearing or orthopedic impairments; Attention Deficit Hyperactivity Disorder; and learning disabilities. Earlychildhood News is an online resource for teachers and parents of young children, infants to eight years of age. “Inclusive Lesson Plans Throughout the Year” was published in May 2007 and can be purchased online for $29.95 (ISBN No. 9780876590140).